What a week. I hate real life. 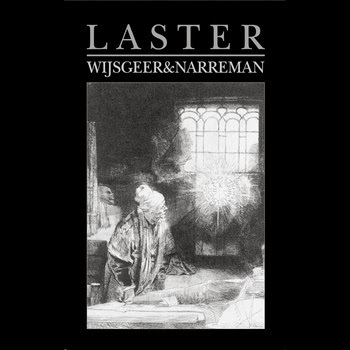 It's time for some escapism in the form of Dutch black metal duo Laster. The three track EP Wijsgeer & Narreman was initially released in April 2012 before making it onto tape in June of the same year, thanks to Dunkelheit Produktionen and on CD later that year in cooperation with Self Mutilation Services. Also, don't be frightened about the " Occult Dance Music" on their Facebook page, as they are most definitely a band with a black heart. Starting with the kind of feedback that sets your teeth on edge, Laster soon lurch into some hauntingly melodic guitar, which is interrupted by harsh screams and cymbal crashes. The guitar musicianship nestling in the recording is actually very subtle and clever, but you’ll have to listen with volume up to hear it. It’s not fast either, more mid-paced, which provides the perfect backdrop for the vocals. The prolonged instrumental sections are very effective at generating a swirling atmosphere and the percussion even has time to groove towards the end, as opener In Levenskolten, In Dadenstorm heads to a conclusion. Tot Eenheid Verweven has more of a necro feel too it, but it’s not totally lo-fi and still features the swirling dynamics of the opener. As with the opener, this song is almost six minutes in length and shows Laster’s fondness for longer, more expansive hymns. The vocals here range from low, rumble gargles to high-pitched screams. For a duo, they manage to make a sound more befitting of a band with larger ranks and that’s quite impressive. The production of the EP emphasises that as well. Things end with title track Wijsgeer Ende Narreman. This is the most harrowing track on the EP in terms of it’s sheer majesty and the occasional symphonic flourishes the reveal themselves. The brass and strings that add textures to the mid-section of the song add to it’s intensity, while the undercurrent of feedback and dissonance hints more towards noise influences. The acoustic section after the five minute mark is a great touch. Musically it’s perfect and while brief, it shows the duo sensitive side. It isn’t long before their back in full battle mode though for the last raid on the senses. Laster paint a picture of futile existence and hopelessness with their black metal. It may not reinvent the blueprint of what black metal should be, but it’s still unique. I would like to hear further compositions from Laster and if you’re a black metal fan at all, you’d be wrong to miss them.